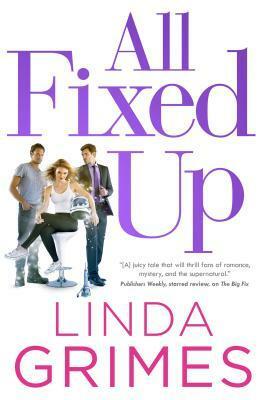 I really enjoyed ALL FIXED UP just as I have the rest of the series. They are so much fun, full of hilarious hijinx, and it’s always interesting to see what mess Ciel gets herself into in each new book, and this one was no exception. Things kicked off to a hilarious start with Ciel winding up on a job impersonating an astronaut doing a flight demo propo. Only problem is that Ciel get extreme motion sickness, so hilarity ensues as she can’t show it. Of course that’s just the start of the mayhem and hijinks. She gets herself into more than a few pickles in this book, almost more than her normal I daresay, and it’s always fun to see how she gets herself out of her messes. Typically I just sit back and laugh, but I have to admit one particular event and choice left me more than a little shocked, and frankly I’m still reeling at her choices days after finishing the book. I’m going to be vague here to avoid spoilers, but at one point I literally wanted to reach through the page and scream at her to STOP! While I understand what she was going through/thinking at that moment, it was such a shocker and utterly the wrong choice in my opinion that it just stopped me in my tracks. The funny thing about that is that while her choice horrified me, I have a feeling others may have the opposite feeling depending on where they stand on certain things. Shocking choices aside, as always I loved the cast of characters in ALL FIXED UP, they are so rich and full of depth. I truly love the utterly strong family bonds and the quirks that not only Ciel, but everyone else had. From the two ruling matriarchs, Mo and Ro, to Ciel’s brothers, Billy, and Mark, the list goes on and on, each and every single one stood out as a fully fleshed character. The various bonds and dimensions between all their relationships truly make this series shine. Add that into the fast paced and high stakes plot, and oh yeah all the extremely hilarious moments, and you have one heck of a winner. Fans of the series will be more than pleased with this fantastic new installment in the Ciel Halligan series. A guaranteed solid block of hilarious entertainment, ALL FIXED UP is not to be missed!